Women's razor blade refills with 5 comfort coated blades for smooth skin in a single stroke. Dermatologically tested for sensitive skin. Features a protective ribbon of moisture with aloe for a smooth glide. 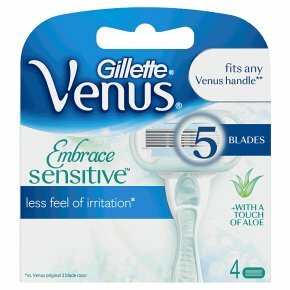 Any Venus blade fits any Venus razor handle, except Simply Venus.Looking for razor blades for sensitive skin, try Gillette Venus Embrace Sensitive women's razor blade refills. These blades are dermatologically tested and proven to provide a closers shave with less irritation (vs simply Venus 2). Each refill features 5 comfort coated blades along with an extra rich protective ribbon of moisture infused with aloe for a skin loving shave.